Many of Montreal's restaurants are offering special Easter brunch menus on Sunday, April 1, 2018. While some offer traditional favorites like lamb, eggs, and hot cross buns, others feature maple syrup creations as part of the sugar shack season. No matter what taste palate you're after or budget you have to work with, you're sure to find a great place. From fancy French restaurants like Boulud in the Ritz-Carlton to a posh high tea serving at one of the city's many tea rooms, there's something for everyone to enjoy on Easter Sunday. Check each restaurant's website for more details on menu options and to make reservations in advance. A traditional sugar shack meal isn't generally Easter-themed, but it sure is a meat-themed feast. Any carnivorous family would love you for organizing a ​cabane à sucre outing, the quintessentially perfect way to celebrate Easter in Quebec. Prices vary by sugar shack, but for an upscale five-course urban experience, try Scéna's Un Chef à l'Érable, a pop-up sugar shack running in Montreal's Old Port on Fridays, Saturdays, and Sundays from March 10 to April 16, 2018. If you're looking for a high-end restaurant with an excellent selection of traditional French Easter favorites, Maison Boulud, located inside the Ritz-Carlton, serves its Easter brunch on April 1, 2018. 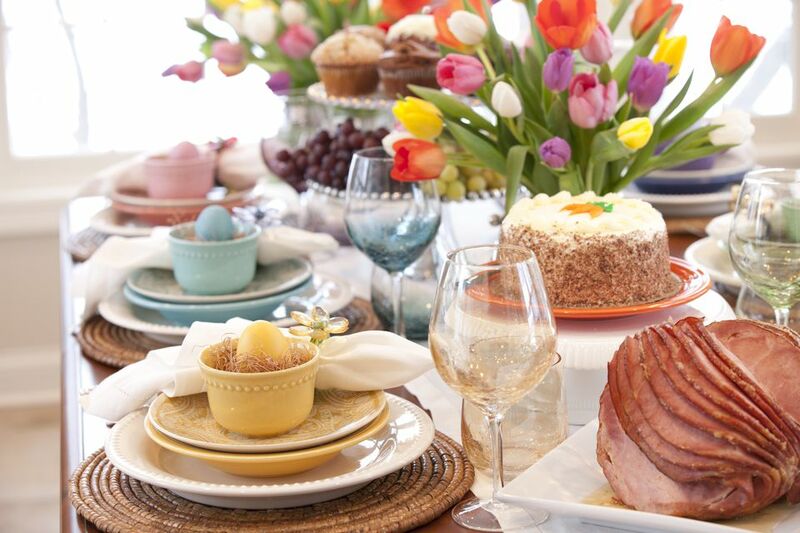 Boulud's Easter brunch menu features crab mimosa, mint and baby pea soup, Kamouraska leg of lamb, agnolotti stuffed with artisanal Quebec cheese, asparagus, morel mushrooms, and strawberry tarts presented as a three-course prix fixe menu. You can't go wrong with Easter brunch at Chez Lévêque, a quaint and classic French bistro on Laurier Avenue known for its good cheer, delightful ambiance, and elaborate holiday menus. Although this year doesn't appear to have a special Easter Sunday brunch menu, they are bringing back their "​Brunch Divin" ("Divine Brunch") featuring gems like light black pudding pie with poached egg and applesauce, a plate of fruit and churros with icing sugar and chocolate, salmon steak served with cold water shrimp and spinach topped with poached egg and hollandaise sauce, and an egg Benedict over English muffin with smoked Fario trout. From 11 a.m. to 1 p.m. on either Sunday, April 1 or Easter Monday, April 2, 2018, bring your loved ones to an Easter Brunch on a boat. Admission includes access to Bota Bota's Nordic water circuit, a mimosa, and brunch (fresh fruit platter with a choice of pulled ham grilled cheese, mushroom flan, or a French style pancake filled with fruit and cream cheese). There's also a treasure hunt aboard the boat featuring spa, chocolate, tea, and activity gift certificates given away to lucky winners. A bathing suit and beach sandals, as well as reservations in advance, are required. Towels, bathrobes, and lockers are provided on site. Parc La Fontaine's Espace La Fontaine proposes an affordable Easter brunch menu and convenient access to one of Montreal's most beautiful parks for play before and after the meal. Easter brunch is served March 28 through April 1, 2018, and includes four different kinds of eggs Benedict, a morning meat or veggie burger served with potatoes, and chocolate strawberry dessert crepes. Reservations are recommended. Instead of going for the traditional brunch activity of overindulging on huge meals, consider heading to one of Montreal's tea shops for a posh afternoon tea time experience. It could be just as delicious as an elaborate brunch, but just be sure to call and book ahead as most Montreal tea rooms that offer afternoon tea require reservations. Additionally, some may not be open on Easter Sunday.